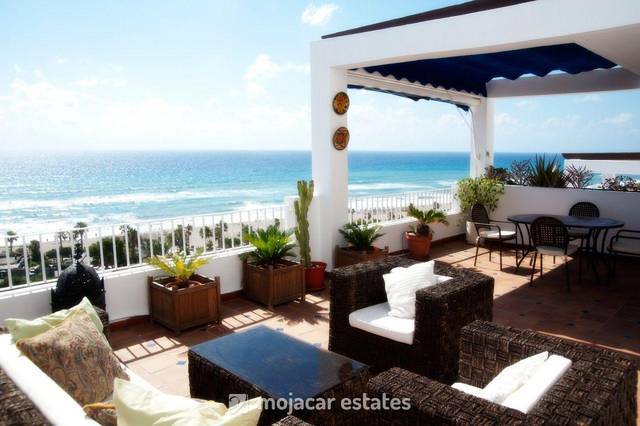 Very attractive penthouse with wonderful views of the mountains and the Mediterranean sea for summer & winter lets on Mojácar Playa, Almería, Andalusia. Walking distance to the beach and amenities. 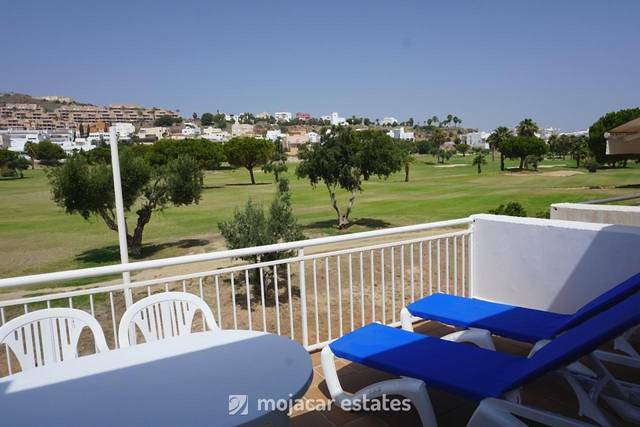 This 3 bedroom / 2 bathroom top floor apartment has fantastic views over the communal gardens and swimming pool and down to the sea. The apartment of 77m2 can be accessed on the road going to the back of the building or it can be accessed from the front of the builiding via the communal gardens with a lift leading up to it. From the parking at the back of the apartments there are stairs leading up to the front door and the terrace that wraps around the apartment. The 3 double bedrooms all have doors onto the terrace. The kitchen is open plan and the lounge-diner looks directly onto the terrace. In summer the terrace makes an excellent extension to the living-dining area and is a very practical, usable space. The terrace measures 56m2 and is east facing. The apartment is fully furnished and the kitchen fully equipped, There is air conditioning in the lounge and ceiling fans in the bedrooms. There are also fitted wardrobes in all the bedrooms. The property comes with a numbered outside parking space at the back of the property. 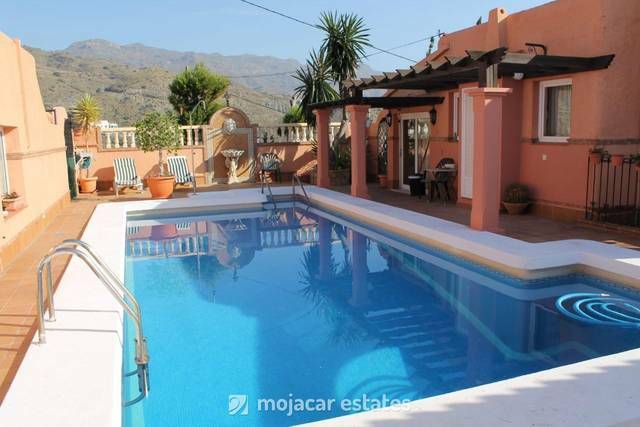 This urbanisation has 3 communal swimming pools, plus childrens´ pool, well kept gardens and a tennis court. 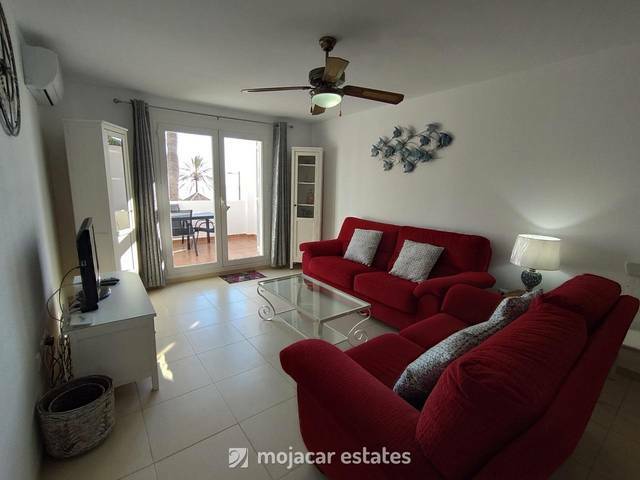 You are a 5 minute walk to the Paseo Mediterraneo, the main road along Mojácar Beach where there are lots of shops, restaurants, bars and other amenities. 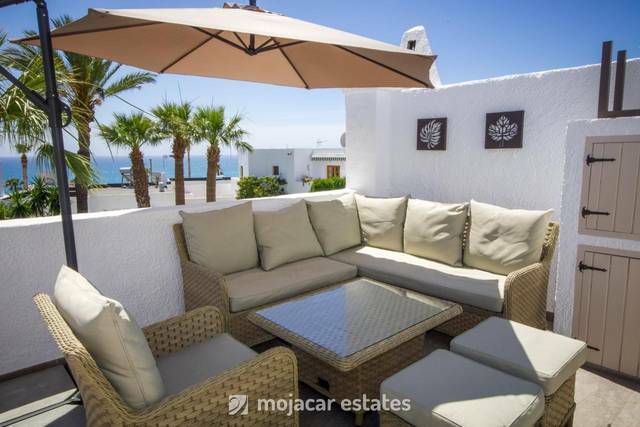 The local bus takes you to other areas of Mojácar, including the village, and there are also buses to Garrucha, Carboneras and Vera. 45 minutes from Almería, Murcia 1 hour and twenty minutes, Alicante 2 hours and Málaga 2 hours and 45 minutes.